Think about a snapshot you took. Maybe it's someplace you visited. Maybe it's you in your house, or with you and your family, you and your friends (or both). Have you looked at it and the day comes back to you? You think, "Oh yeah, we had this wild, adventurous drive to reach that destination on the edge of a cliff, overlooking a spectacular view. The wind was blowing. And that person there-- what was his name? -- he'd say the most outlandish things. He said-- oh yes, now I remember! he teased me and whatever I said, he'd argue the opposite side. But he did it with a smile, and we all had a great time. We went to a little burger stand afterwards, and I remember spilling ketchup all over myself, and that teasing so-and-so did an about face and dove for a thousand napkins for me and mumbled, 'Sorry, sorry, my fault' -- and it wasn't his fault at all." That snapshot just transported you to another time, and prodded the inner movie camera in your mind to replay all the events of that time, complete with sensations (windy, and cold), feelings, and a recollection of who all was there. Photo Albums and Oral History. The photo collections that you have around -- or the photo albums that your relatives have -- are keys to transport people directly to times in their past. Together, you look through the albums while the other person -- your interviewee, or the storyteller -- tells you about what's in the pictures. If you record the conversation you have while looking through the photo album together, the two of you are creating an oral history centered on the photo album. An oral history is the recording and preservation of spoken recollections about past events that someone participated in, or witnessed. You can get the first person "I was there" story about the photographs. For even older photographs, where the interviewee wasn't there, but is old enough to recognize the people who were there, you can capture the knowledge of the person who can tell you who's who, and perhaps "where's where" in the photos, and whatever other stories about the people or places in the photographs. The photo is full of details that are clues to more questions. Look at the photo. The location. The clothes. The furniture or possessions. What is it? Is it significant? Ask about the things you see in the photos. Photos live outside the interviewer's list of questions. Photos, on their own, can call forth memories that you as the interviewer don't know about. You never know where a story may come from. My example doesn't necessarily have to do with photos, but it illustrates how stories come from everyday, overlooked objects. I've been hanging out at my parents' house a lot recently. One day before lunch or dinner, I was in the kitchen, using a cutting board. It's round with a handle, and casts a shadow identical to a small skillet. It has a little edge ornamentation. I've seen it around the house for, like, forever. While either chopping on it or washing it, my mother tells the story of the cutting board -- when her mother Forence went to Europe (and my mother didn't go-- as detailed in this movie), Mama brought back a cutting board for her daughter. She told the story of not going on that trip and what her mother brought back for her. Who knew that this everyday prosaic chopping board had a story of the relationship between my mother and her mother? I didn't. It just came up. The lesson to you is that the objects you see in the photos may also bring up stories. You don't know ahead of time which objects are story fodder and which ones aren't. Photos show who was there. At basic bare bones, you want to know, Who is that in the picture, and how is that person related to you? Photos are also a record of people that you don't recognize, but your storyteller does. In that case, the interviewee wasn't there, but knows who the people are, and maybe recognizes people and places that you don't know. If your storyteller is telling you about people and places at a one step remove, the photos may act to launch recollections about the people in the pictures. "Tell me about Great-Granddad-- did you hear stories about him?" "Well, Great-Granddad was a real raconteur, I tell you. My father and his brother and sister used to listen to his stories and songs when he came to live with the family." Here are some things to look for when recording stories about photos. One is a visual medium. 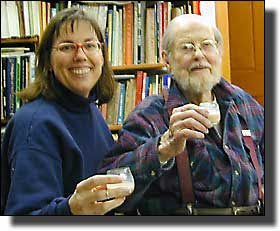 The other is a recording -- aural and/or video, where the interviewee (or storyteller) describes recollections of past events. What you're about to do is to create a new artifact, an audio recording, that's intimately tied to other artifacts--the photos. You need to stand in for future listeners who aren't there with you, and who aren't seeing what you're seeing in the moment -- from gestures of the speaker, to the pointed finger at the album saying "this photo." Provide some extra context. Start the recording by noting the date, the place, and the names of those who are having this conversation. If your recording takes place in more than one session, or is recorded on, say, more than one spool of tape or more than one digital file, begin with that Who When Where What at the beginning of each recording session. "This photo" or "This page" doesn't provide enough information for later. But you can provide the context pretty easily. "Okay, we're looking at Aunt Doris' photo album. 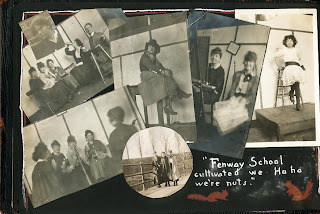 We're on an early spread with a bunch of art students, and there's writing that says, 'Fenway School Cultivated we -- ha ha, we're nuts' and in the center is a photo of Doris posing in her cowgirl outfit." Anyone looking at the album (or a scan of the album) can identify the page from that description. Or, if the conversation is about someone in the photo, identify who and where in the photo the person is. Suppose your storyteller says, "That's Great Grandpa" while pointing to a person in a photo. Well, fine, now you know, but someone who has the photo album and the recording does not. Fill in the details: "We're looking at the lower left photo -- Every one's on the porch, and Great Grandpa is the 2nd person from the left." You've now filled in what the speaker means by "That" in "That's Great Grandpa"
You can also temporarily label the pages or the photos, using post-it notes with numbers or letters on them. Supposing you gave the photos post it notes where each page had a letter of the alphabet to it? "That's Great Grandpa" says the storyteller narrator. And you say, to clarify, "The lower left photo on page H-- He's the second from the left." Then you take a reference photo of the album with the post its in place so you know what you mean by the H page. If you go this route, you need to be brutally honest with yourself-- are you going to make your reference photos? yes? Cool. And good on you, you over-achiever! ;) If not, provide enough context for the page as it is. I go for the default position, because a few words in context is enough to provide adequate orientation. "Oh, it was about this [gesture] big"
"About a foot and a half long?" "Yeah, foot-and-a-half, maybe two foot." Be open to any stories, even if they're not related to the set of photos you're looking at. Don't just look at the photos, or, Advanced Photo Album Oral History tricks. If you spend all your time looking at the photos, you may miss something important-- the facial expressions and body language of the storyteller may tell you that there's more to a story than what is being said at the moment. I didn't realize this point until I sat across the table from two people who were talking through a photo album. (I was the quiet observer with the recording equipment.) They sat side-by-side, both looking at the photos. Since I was facing them (and the photos were upside down), it was easier for me to see the storyteller. At one point, he shrugged. Significantly. I thought, "Oh, there's a story behind that expression." But the interviewer's eyes were on the photo, and he missed the opportunity to ask further, "Are you remembering something else?" or "What's behind that shrug?" From time to time, take your eyes off the photos and look at the speaker. You may find a story in a grimace or a shrug or pursed lips or some other expression. You may already be a winner! In fact, you are! Now that I've piled you up with all manner of obligations and things to watch out for, I leave you with a light burden. You as interviewer are juggling several tasks simultaneously. As interviewer, you're operating the equipment, you're looking at the photos too, you're supplying background information to fill in for the eyes that cannot see what you see, and you're keeping an eye on the storyteller to see if there are additional cues for additional stories. Please don't let these extra set of tips be so intimidating that they stop you from asking your relative to tell you about the photos in that album. If you sit down to talk about the photos with someone who was there--or knows the people who were there-- you win! If you record the conversation, you win! Extra. If you're able to provide some extra context that helps for someone who will listen to the recording later, you win! Extra Plus. If you're able to pick up on nonverbal cues in the expression of your storyteller, you win! Extra Plus. Double Plus Good. Remember though, you already won when you sat down to have the conversation. What a terrfic article, full of wonderful tips - thank you so much! Nothing like snapshots in time to take you back. I can't look at old back and white photos without wondering who they were and what their lives were like. Great post full of tips! Thank you for your very well written and researched article on using photographs in oral histories. You have helped to make the Friday From The Collector Series a success! 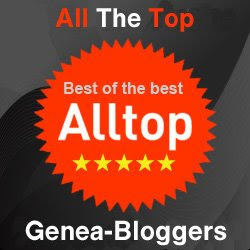 And congratulations on being named an article of the week on Randy's GeneaMusings. Susan, just reading your article (been in the wilderness without phone or internet) and enjoying all the good ideas - as always. The tip about having a third person to watch the interview makes so much sense now that you point it out. One thing I discovered on this trip was how useful my EEE PC with webcam can be to capture an interview - same goes for MacBooks. Just use the builtin tools to record the conversation - video and sound. The one I created on the trip isn't ready for primetime, but it sure gave me some great ideas for future uses. fM - Shades is becoming a fabulous resource for all us photoholics. Each week it just gets better! I just got around to reading this after a busy few weeks, and I'm so glad I did! I've been planning on sitting down with my grandparents and some photo albums for some time now, and haven't gotten around to it yet -- but these tips are invaluable! I love the gentle yet precise way you suggest to bring the subject and the viewer to a particular photograph. In our work making video biographies, we often film the subject turning the pages of the album (slightly above and to the side), pausing here and there to talk about an image. It makes a nice change from the straight interview set up and you normally get some nice shots of (old) hands pointing here or lingering there. The other thing we watch out for is background items in the photograph. As I am sure most readers will know, you often get a great recollection from an accidental business or road signs, houses, or even a person who was caught accidently in the shot.